The two bad things that can happen when you're stuck in daily fire-fights, maintenance tasks, and tactical activities. What the definition of "strategic pricing" really is and why it's so easy to misunderstand the function and get it wrong. Four areas of focus that can help you improve your business' financial performance---and your own career prospects. The three important "gotchas" you need to watch out for when making a change to be more strategically focused. Mark Burton, co-author of the book, "Pricing with Confidence: 10 Ways to Stop Leaving Money on the Table," talks with us about the next evolution of the pricing department. 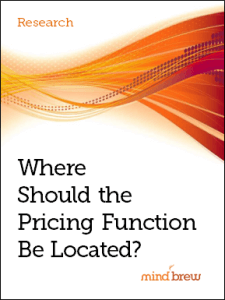 Where Should the Pricing Function Be Located? Should Pricing report directly to the CEO? Should it be located in Sales, Marketing, Product, or Finance? While none of these organizational locations is perfect, through our research, we've been able to identify and document some of the common pros and cons associated with each location.